Is Pod Coffee as Healthy as Filtered Coffee? Is the Most Expensive Coffee in America Any Healthier for You? How Much Caffeine is in a Coffee Bean? What Are the Benefits of Organic Coffee Consumption? Coffee is the most popular beverage in the world after water, a standing which helps rank it as one of the largest traded commodities — second only to oil, according to “The Organic Food Shopper’s Guide.” Organically grown coffee is free of chemical residues, an attribute that prompts many connoisseurs to claim it has a fuller, richer flavor than conventionally grown coffee. Only a moderate number of coffee drinkers need opt for organically grown beans to make a substantial positive impact on the environment and in the lives of organic coffee farmers. In an effort to produce less-expensive coffee, conventional growers clear-cut rain forests, creating full-sun coffee plantations throughout South America, Africa and southeast Asia. In tropical regions, nutrients aren’t stored in the soil, but rather sucked up for immediate use by the dense, wide diversity of plant life. With deforestation, nutrients disappear with the vegetation. Planting a monocrop coffee farm on soil sapped of nutrients necessitates the use of chemical fertilizers to feed the plants. Pesticides are another requirement, because the predators of coffee pests are eliminated along with the forest. Without the canopy's shade, the ground water supply dries up, hardening the soil over time. Deforestation also adversely effects migratory bird populations, which have fewer places to winter in South America. Most organic coffee growers, meanwhile, grow their plants in the shade of the rain forest. The ecosystem provides adequate plant nutrition, and its biodiversity eliminates the need for chemical pesticides and herbicides. The Environmental Protection Agency warns that 30 percent of insecticides, 60 percent of herbicides and 90 percent of fungicides are carcinogenic, or cancer-causing. Pesticides and other conventional farming chemicals accumulate in body fat, and can cause damage to the nervous and reproductive systems. These chemicals can also disrupt hormone and immune-system function. Pregnant and nursing women who ingest traditionally grown coffee pass the chemical residues on to their fetuses or nursing babies. Because babies’ bodies have less fat, these chemicals are absorbed more easily by their internal organs. Pesticides and other farming chemicals have been linked with developmental and behavioral abnormalities. Drinking organic coffee eliminates the health risks posed by conventional coffee. Although not all certified organic coffee is also fair-trade certified, the two often come hand in glove. 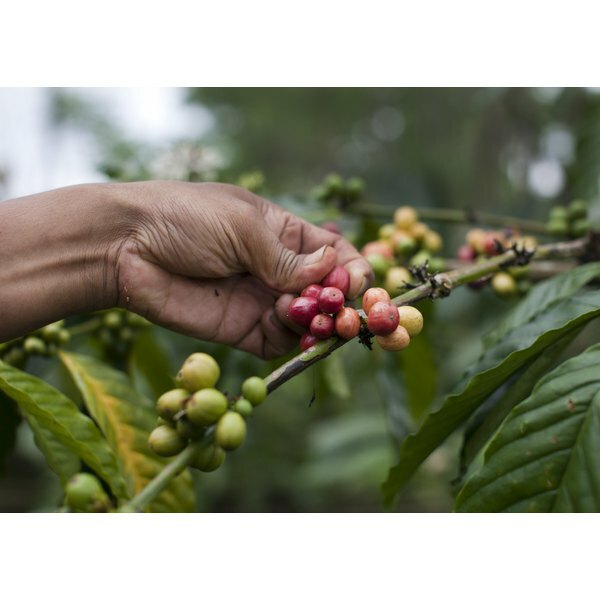 Without fair trade practices, small organic shade-coffee farmers must compete with the low prices set by the large conventional plantations, the Green Living Expert website notes. Organic farmers often end up receiving less than their production costs and are consequently driven off their land, which is then clear-cut for another large plantation. In an effort to maintain the livelihood of organic coffee growers, fair trade cooperatives pay a higher, guaranteed price to farmers within the cooperatives. As of 2008, the coffee market paid 30 to 50 cents per pound, with an extra 15-cents-per-pound premium for organic beans. In contrast, fair-trade growers were paid $1.41 per pound of certified organic coffee. For a coffee to be certified organic, its grower must prove that both the beans and the soil are fertilizer-, chemical- and residue-free, which typically takes at least three organic growing seasons to accomplish. Triple-certified coffees come from farms that hold Quality Assurance International’s organic certification, are fair trade-certified and also hold the Smithsonian Institution’s shade-grown certification. Triple certified arabica beans are the highest-quality organic beans you can buy. Avoid robusta beans, which are usually grown on full-sun plantations that damage the environment and cause significant social turmoil in the regions where they're grown. Can Coffee Help Deal With Stress? Does Coffee Help Boost the Immune System? What Are the Advantages of a Greenhouse?